2017 marks the year of Maya Deren’s 100th anniversary. Born in 1917, the Avant-Garde filmmaker, dancer, poet, writer, anthropologist and catalyst for what is called Choreo-Cinéma, has influenced artists and thinkers from different fields, in particular those interested in experimental film and in the intersection of film and dance. In 2017 her work is still relevant in terms of the images it offers, the stories it tells and the questions it asks about individual experience, communal traditions and our narratives. The interdisciplinarity of her work marks her as a pioneer of hybrid visual languages and has much to offer to contemporary artists whose work increasingly negotiates between different practices, languages and traditions. Whilst being highly refined and specific Deren’s work claims a “touche-à-tout”. This event will reflect on Deren’s work from several perspectives, to re-examine not only her films, but also her writing and her anthropological research into Haitian rituals and voudoun. Maya Deren 100 will run over three days and in three parts, with a symposium, a series of screenings, and interventions by contemporary artists. Maya Deren – REpositioned aims to historically review and contextualise her work, her principles, aesthetics and methods from diverse contemporary perspectives. Engaging with Deren’s artistic, theoretical and pedagogical discourse, the symposium aims to foster discussions on choreographic, visual and performative languages, on the role and potentiality of narratives, on collaborations and on the idea of metamorphosis or change as suggested by Deren’s notion of Unstable Equilibrium. Furthermore, proposals are invited that examine Deren’s writings on ritual, her concern with time, space and matter, as well as those engaging with dialogues between (digital) screen bodies and live bodies, screen space and narrative time. Finally, Deren’s output as both female artist/auteur and as the main performer in her work is to be re-examined from today’s point of view. Maya Deren 100/Unstable Equilibrium is a project produced by Tanzrauschen e.V. (Sigurd-Christian Evers and Kerstin Hamburg) and Neuer Kunstverein Wuppertal e.V., organized in collaboration with initiator/artistic director Florence Freitag, as well as curators Claudia Kappenberg (University of Brighton, UK, International Journal of Screendance) and Dr. Elinor Cleghorn. 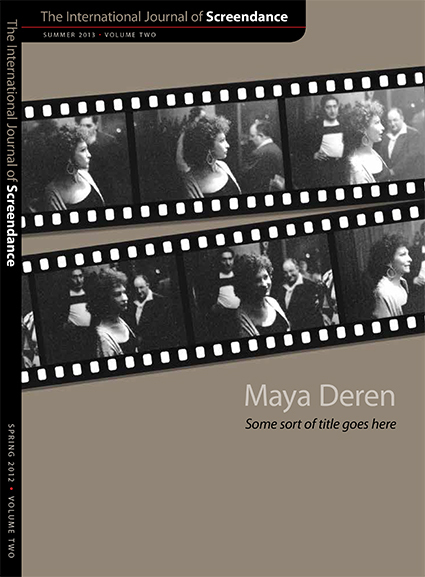 After Deren is the 3rd issue of the International Journal of Screendance. It is published by Parallel Press and available online. If one has 24hrs it doesn’t matter if technology fails at some point, as there is plenty of time to fix it. With 24hrs there is little pressure to ‘perform’, because there enough time for ideas to emerge and things to happen. There is also a chance to get to know the people who have come together, and one can begin a conversation, continue a few hrs later and resumer the next morning over a cup of coffee. There is even enough time to take a nap, and to come back and see where things are at. It is not surprising that the the digital community has taken a linking to this sort of working; it is communal, fun, enterprising, supportive, and low pressure. We started at 7pm on Saturday eve and by Sunday morning there were new hacks to explore, responsive systems that could be interacted with and tested through movement, to find the strange edges where it would kick in, or drop out. It was interesting to see that the hacks would initially encourage movement and lots of it, while over time the same hacks could also be explored as to their potential to slow down and to minimise activity. The different possibilities lead to specific and precise dialogues between technology and body(ies). This encounter between technologists and movers seems very timely, as otherwise how will we comprehend, explore and advance was has already become an ubiquitous feature of the everyday, the interactive screens on which we are represented. Highly recommended. I would like to draw your attention to this 24hour Dance Hack on the 21st/22nd September. The event is a collaboration between the University of Brighton and South East Dance, and part of BRIGHTON DIGITAL. We will have a large theatre space for 24hrs to hang out, think, collaborate and explore . The event will be streamed live via youtube, so you can make and stream work, stand on your head or sit back and observe. We will provide food and drink and a few bits of technology. You can of course bring your own laptops, cameras and other such gadgets. Go to BRIGHTON DIGITAL for more info and to book a place. On the occasion of a conference by the Society of Dance History Scholars (SDHS) in Philadelphia’s Centre for the Arts the Screendance Network met to do some blue-sky thinking for future projects and finding bids, exploring possible activities, residencies, partnerships, symposia and conference interventions, as well as other publications that might complement the journal. The network was hosted by Ann Cooper Albright at a beautiful old farm, which offered plenty of room for debates, ambling and diversions.